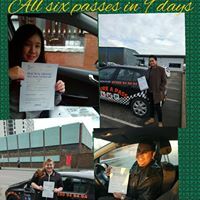 Secure a pass driving school also offers driving courses in Nottingham to help you learn to drive in a short amount of time and pass the practical driving test fast. If you are looking for refresher driving lessons in Nottingham to brush up your driving skills then our experienced, professional driving instructor in Nottingham can help. Driving lesson prices can change without notice, any existing customers will not be affected if driving lesson prices increase. The short notice test booking would need to be paid for in advance using bank transfer or cash by meeting the driving instructor. The driving instructor reserves the right NOT TO let you use the car on test if the instructor feels you are a risk to yourself or for the examiners' safety or other road users. As a result, you will lose your payment for the time booked. Any lesson cancellations should be reported within 48 hours to your driving instructor to avoid being charged for the driving lesson. This allows your driving instructor to get someone else booked in. Your driving instructor should also give you a 48hour notice cancellation if a lesson needs to be rearranged. For unseen circumstances i.e Bad weather, Mechanical fault with the learner car etc the driving instructor should let you know as soon as possible. Secure a pass driving school reserves the right to alter prices on the website before any notice, Secure a pass driving school will not increase driving lesson prices for pupils already taking driving lessons and would lower prices if the price lowers on the website helping our customers save as much as possible. There are no refunds on driving courses, lessons or prices.